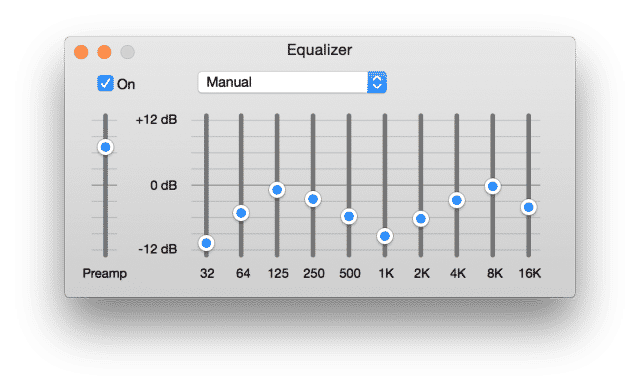 I just spent entirely too much time researching equalizer settings for iTunes. The image above shows what I’ve concluded are the best settings. Keep in mind that I’m not an audiophile. Here’s what I can tell you about the settings, though. The basic idea is that you want to come down from the middle, not go up from it, and that the pre-amp settings are supposed to provide the boost you’re looking for. I got a nearly identical conclusion when researching how to tune my car’s Bang and Olufsen sound system: Go from the center down, not up.. The setting seem to sound really good. I tend not to trust #2 that much, however, as I’m always worried about bias. Once I change the settings and listen for a few moments I can’t really remember how the other settings sounded. Anyway, hope this helps save someone some time. And if you find settings that you think are better, let me know in the comments or on Twitter. I’d love to improve my setup.